One year, we had a Pumpkin Patch Halloween Party theme and it was one of the easiest parties to plan and decorate for. Here are some of the fun ideas we came up with for our Pumpkin Patch party. I was very proud of myself 4 years ago to have come up with all of these ideas on my own because in this country Halloween doesn’t exist but we didn’t let that stop us from enjoying some of our fun little traditions so I had to get creative. I shared them on my blog years ago but back then it was itsy bitsy and it didn’t get much traffic. Enjoy these easy Halloween party ideas! Mandarins are in season here during the Fall and we can get them super cheap so I came up with this. I personally would not let my child eat a mandarin that he got from trick or treating so I would only advice to hand these out for a class treats or party. I just used a sharpie on the mandarin. These are also super easy and I have even seen it done with clear cups filled with orange juice or orange punch. Same here a sharpie and some green tissue paper for the top. I’ve yet to meet a kids who doesn’t enjoy play dough. My kids can play with forEVER. It’s always a hit as a party favor so I have found ways to get creative with it depending on the them. And once again a sharpie and I made my own play dough get all the details here. This pumpkin is adorable! Find out how to make this Halloween Toss Game at We Made That. Pumpkin Balloon Bust Game – We put candy in each balloon and they were able to enjoy it once they popped the balloon. They were blindfolded to make it a bit more challenging. The little ones could choose if they wanted to be blindfolded or not. I was surprised how this activity was a big hit with the guest. Pumpkin Cupcakes- One of our guest brought this. The lovely thing about this treat is you can either choose to buy your cupcakes or make them yourself, then just shape them and ice them. Voila you’re done. 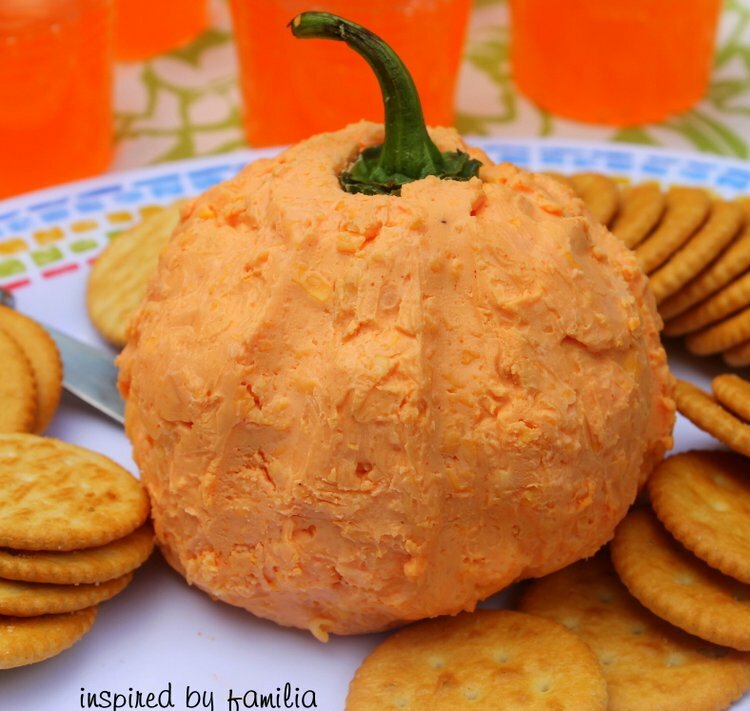 Pumpkin cheese ball – Check out the recipe and don’t be fooled by the picture it’s super easy to make. She used the top of a bell pepper for the stem. Now it’s your turn to share your fun family friendly projects, crafts, home décor, recipes, kids activities, homeschool fun…. in our Hearts for Home Blog Hop below. Remember your projects will show up in over 20 websites, now that’s some exposure! By linking up you give us permission to feature your post.